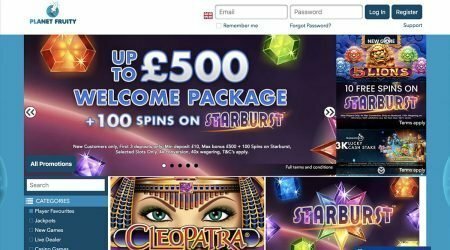 Planet Fruity is a relatively new UK online casino, launched in March 2018. It is one of the latest Nektan casinos and now offers almost 400 online games. 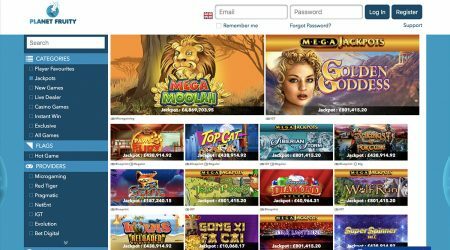 Its offerings include all the classics, such as roulette and blackjack, plus plenty of slots, catering to a wide range of tastes and customers, whatever their style of online gambling. Planet Fruity has a fun, colourful and easy-to-navigate website and user-friendly content to help you explore the site and find answers to your questions. The casino also offers a generous welcome bonus. Planet Fruity offer various bonuses to new and existing customers, including the very generous deposit bonus mentioned below. Some promotions are temporary and will change over time. Examples of the type of bonuses that Planet Fruity runs include the Winning Wednesday bonus, which can give customers a boost of 15% on their winnings, as long as they deposit a minimum of £25 during the promotional period. There are also free bonus spins awarded when customers make new deposits of at least £20. Keep your eye out for new promotions, as it seems that Planet Fruity is dedicated to offering a customer experience that keeps you playing, and it is reasonable to assume that it will roll out various extra bonuses as it continues to grow. Planet Fruity does not seem to have implemented a loyalty scheme as yet, but it is a new brand that is currently focused on attracting new customers. A loyalty scheme or bonus could come on line in the near future. New customers at Planet Fruity get a generous welcome bonus of up to £400 to play with, and 150 free spins. As is usually the case, the value of your welcome bonus will depend on the value of your deposits, but Planet Fruity is different from many online casinos, in that it will let you spread your welcome bonus across your first three deposits. When a new customer opens an account and makes their first deposit, Planet Fruity will match the value of that deposit by 100% up to £100 and give you 50 extra spins on its Starburst game. A second deposit of up to £100 will also attract a 100% matching bonus and another 50 spins. Place a third deposit and you will receive a 50% match on the value of the deposit, up to £200, and yet another 50 free spins. Obviously, the structure of this bonus is aimed at not only attracting but also retaining new customers, encouraging them to not only open an account but also keep depositing more funds (and, of course, playing with them). A significant investment is needed to reap the full rewards and walk away with your £400 of bonus money. 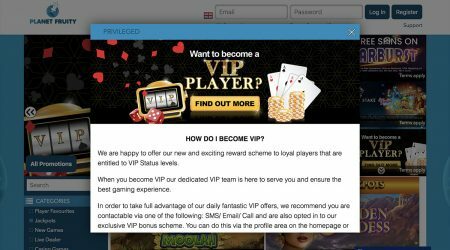 However, if you do, then this is definitely one of the most attractive welcome packages being offered by online casinos. Planet Fruity bonuses carry a wagering requirement that will be specific to the terms of each individual promotion, so check the terms carefully before participating in offers. You will not be able to convert bonus funds to cash until the wagering requirement for your bonus has been met, at which point the bonus will be converted automatically. Be aware that some wagers (for example, on Jackpot Games and also on some slots) will not contribute towards the wagering requirement of your bonus money, and some games have lower weighting than others when it comes to meeting the wagering requirement on a specific promotion. There are different rules for slots, premium slots and table games. As with any online casino, it is vital to read and understand all the terms and conditions when claiming bonus money. Pay particular attention to wagering requirements as they can be complicated and are different for different promotions. As already mentioned, Planet Fruity provides free spins on Starburst as part of its welcome bonus, but it doesn’t stop there. Extra free spins are offered to existing customers when they make new deposits. 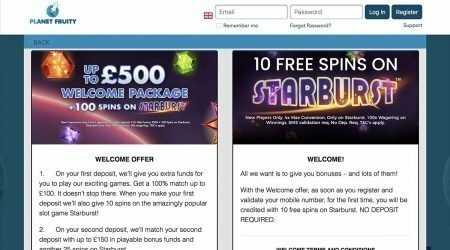 At the time of writing, there are 40 free spins available for customers depositing at least £20 and 100 free spins for those depositing £40 or more. Again, check these bonuses before depositing, as Planet Fruity seems to be mixing things up and changing its promotions from time to time, as you would expect from a relatively new casino. Planet Fruity offers almost 400 online games, with many different themes and features. There are several variations on all the main casino classics, such as roulette, blackjack and poker. Offerings include Speed Roulette Live and Double Ball Roulette, as well as live dealer blackjack, including Blackjack Diamond VIP and Blackjack Fortune VIP. When it comes to slot games, there is a wide variety available from a range of different providers, including Aristocrat, Blueprint Gaming, NextGen, and many other well-respected names within the industry. Slots that are currently online include Starburst, Rainbow Riches and Twin Spin. It is fair to assume that more will be added as this young online casino grows. Gaming on the go is obviously important to many online gamblers, and Planet Fruity provides mobile apps allowing you to play around 100 games, for real money, from your smartphone or other mobile device. Planet Fruity allows you to deposit funds using a range of payment methods, including major credit and debit cards, PayPal, Skrill, Neteller, Sofort and paysafecard. You can withdraw using most of these methods, though there are more limitations on withdrawals. Obviously, all payment methods are dependent on what is available in your country. Some payment and withdrawal methods (notably Boku) will incur a fee, but most are free. Planet Fruity supports payments in several different currencies, including GB pounds, euros and Canadian dollars. Planet Fruity uses innovative technology to run security and verification checks, meaning that there is often no need for customers to upload documents to verify their identity. However, it may sometimes be necessary to upload verification documents in order to make transfers and withdrawals. There is a minimum deposit of just £10 with most deposit methods (with Boku, it is £15, presumably because of the transfer fee). It is also important to note that you can’t withdraw with Boku, so you will need to add another transfer method before cashing in any winnings. There is a minimum withdrawal of £20, and a maximum of £2,000. Customers can make one withdrawal every 24 hours. Withdrawal is straightforward but can take up to three working days. It is, of course, important to be able to access customer support easily, and get prompt answers to any questions that you may have. Planet Fruity has a very detailed FAQs section, allowing new customers to find answers to all the most commonly asked questions in one place. Planet Fruity also has good customer support availability, with email support, live chat and a UK telephone helpline. Email tickets will be replied to within 24 hours, and both telephone and live chat support is available from 8am until midnight, UK time. Like most reputable online casinos these days, Planet Fruity has made a public commitment to encouraging responsible gambling, and customers can contact support to discuss potential gambling problems and ask about putting safe checks in place (such as deposit limits on their account or taking a Time Out) to support them in their quest to gamble responsibly. Planet Fruity provides a good all-round experience for online gamblers, with a variety of table games, card games and slots. The website is fun, clear and user-friendly, with specific sections laying out everything that new and current customers need to know. The content is friendly, welcoming and informative, and it is immediately clear how to register, create an account and claim your bonuses. Planet Fruity is a new casino that is still finding its feet and experimenting with different incentives and bonuses, but it is part of the well-known Nektan brand, and it is fair to expect that it will continue to develop with a strong commitment to customer experience and support. The welcome bonus is currently one of the most generous available, with a matched deposit of up to £400 in bonus money and a significant amount of free spins. We like the fact that the deposit bonus can be spread over three deposits, providing a certain amount of flexibility and allowing more customers to access the full bonus by spreading the deposit cost. Customer support is one area in which Planet Fruity could make some changes. Both phone support and live chat are only available from 8am until midnight, UK time. This is fine, but online gambling takes place 24 hours a day, across various time zones, so going the extra mile to provide 24-hour support would be an obvious improvement. The casino could also offer more bonuses and promotions for current customers, though that may happen as the brand becomes more established. Overall, Planet Fruity is well worth trying, especially now while the significant welcome bonus is in place.